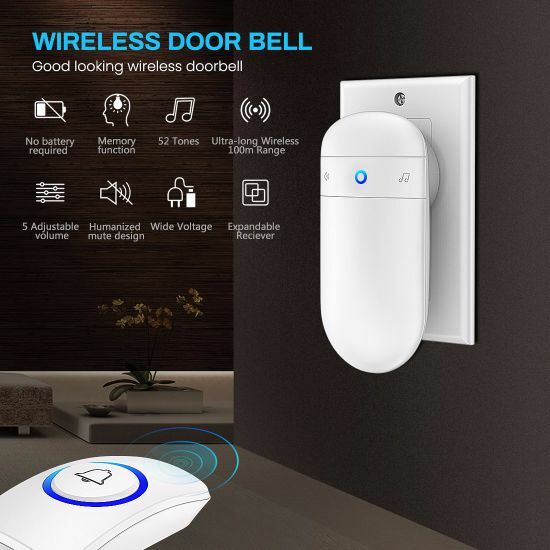 Wireless Doorbell, Doorbell, The Doorbell manufacturer / supplier in China, offering Wireless Doorbell, Mini HDMI to VGA Adapter (with audio), Bluetooth 5.0 Wireless Earbuds with Auto-Charging Box and so on. [Rich Melodies] Every receiver is preset with 52 melodies and 5 levels of volume from 0 to 115 dB; different ringtones can be set so that you will know exactly which doorbell is ringing. [Humanized Mute Design] Our doorbell is featured with mute design. You can set to mute mode on the host when ringtones are not needed. Such a considerate design ensures you with undisturbed lunch break or weekend. [Extra-long Transmission Distance] As far as 1,000 feet/300 meters of long transmission distance in open space. Press and ring with sensitive and stable receiving signals. The upgraded smart chip brings more melodious ringtones after optimization and other household electronic devices will never be interfered. 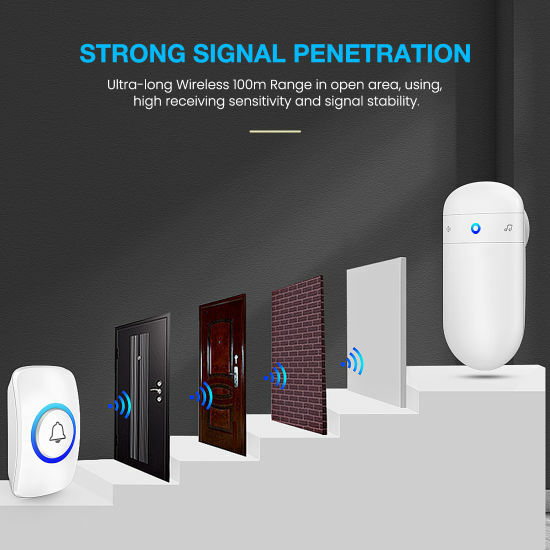 [Superior Signal Penetration] wireless doorbell can successfully transmit signal to the receiver even being separated apart by several walls and doors. 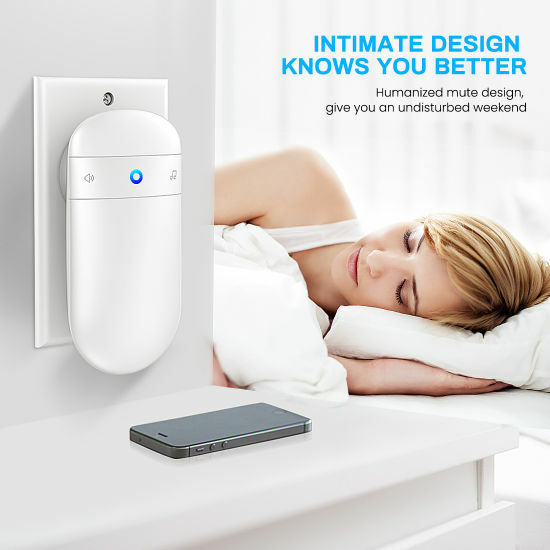 No matter where you are, in the bedroom, in the kitchen, in the living-room or just upstairs, you will never miss your visiting guests. [Lifelong Worry-free Warranty] With FCC, CE, RoHS certification, provides 360 days of warranty and lifetime customer service. We will solve any problems for you within 24 hours. 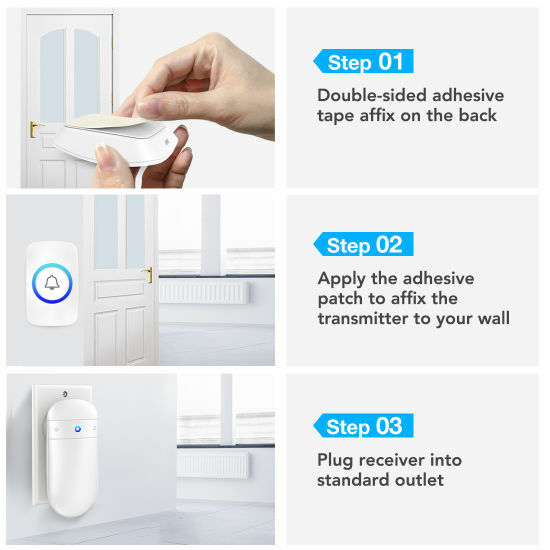 With the upgraded smart chipset, wireless doorbell is featured with the high-quality voice processing technology which can integrate as many as 52 optional ringtones. Our wireless doorbell is suitable for apartments, villas, shops, restaurants, hotels, residences, banks, schools, office buildings, conference rooms, etc. Simply plug the receiver into any power outlet (either power strip or wall outlet), then use the screws or adhesive strips we provide to fix the button on the wall or door without any additional wiring. To save you time, our doorbell may be installed within only one minute. Set ringtones where you need them, plug and play. Ringtones and volumes can be switched at your will and different ringtones can be set for different receivers. 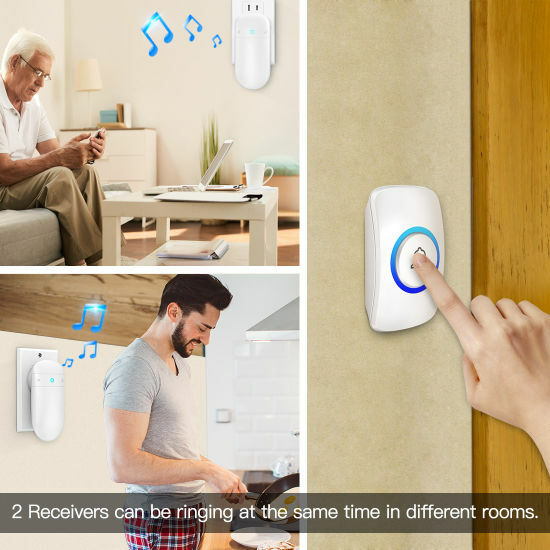 One button can be bonded with multiple doorbell receivers, so that you can place different receivers in different rooms to realize full ringtone coverage. Super low power consumption; built-in battery with long service life of more than 3 years; IP4 dustproof and waterproof; working temperature ranges from -20°C to 50°C; withstand all kinds of severe weather conditions. wireless doorbell is featured with impressively 52 different styles of ringtones which will surely include your favorite one. It even includes the ringtones suitable for different holidays and seasons. We sincerely hope it will make you feel fully relaxed. No matter where you are, preparing food in the kitchen or playing in the garden, using the toilet or watching TV in the living-room, wireless doorbell will make you never miss your visiting guests. The optional high volume and color LED indicators are especially helpful for the senior citizens with hearing impairment. The professional design full of fashion trend, the pure and simple colors as well as the round and elegant appearance will make it a wonderful decoration in your house no matter where they are installed. even the receive is installed close to the ground. When restarting after power failure, the doorbell will automatically resume to the last setting.